How to resize for Linux? Please make sure to preform a backup prior to partitioning. Although a standard process, there's always an increased risk of corruption or failure when modifying partitions. But this shouldn't be an issue as you have been backing up regularly........right? Partitioning a storage device divides it into individual partitions, which are listed as separate volumes under the Devices section in the Finder sidebar. You may need to partition a disk if you want to install multiple operating systems or if you need to change the device’s format. If you’re partitioning your internal physical disk because you want to install Windows, use Boot Camp Assistant. WARNING: To prevent the loss of data on your Fusion Drive, don’t connect it to a Mac that’s using a version of OS X earlier than v10.8.5. For more information, see the Apple Support article Only connect OS X Mavericks Fusion drives to OS X Mountain Lion v10.8.5 or later. You can easily create new partitions on a device with at least one volume that contains data, if it has space available. Important: As a precaution, it’s best to back up your data before creating new partitions on your device. Select the device in the sidebar, then click the Partition button . Internal storage devices appear under the Internal section in the sidebar. External devices appear under the External section in the sidebar. When you select a volume that already has data on it, the pie chart shows a shaded area representing the amount of data on the volume and an unshaded area representing the amount of free space available for another volume. Disk Utility also reports whether the volume can be removed or resized. If you see a small volume with an asterisk, the partition is smaller than can be represented at the correct scale in the chart. Disk Utility splits the volume into two, leaving the data in one volume, and creating a new, empty volume. 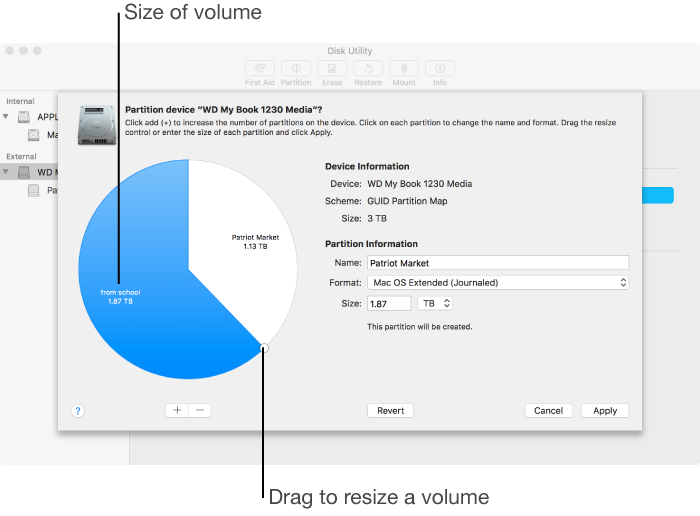 If the existing volume is less than half-full, Disk Utility creates two volume of equal size. Otherwise, it creates one volume large enough for the existing data, and another volume with the remaining space. Depending on the space available, you can create multiple volumes by selecting the new partition, then clicking the Add button ! [enter image description here]3. Click each volume in the pie chart on the left, then enter a name for it. For MS-DOS (FAT) and ExFAT volumes, the name must be eleven characters or less. Enter the size or drag the divider to increase or decrease the size of each volume. For each volume, click the Format pop-up menu, then choose a format. Mac OS Extended (Case-sensitive, Journaled): Uses the Mac format and is case sensitive to file and folder names. For example, folders named “Homework” and “HOMEWORK” are two different folders. Mac OS Extended (Case-sensitive, Journaled, Encrypted): Uses the Mac format, is case sensitive to folder names, requires a password, and encrypts the volume. Click Show Details to view the step-by-step process of creating a new volume. When Disk Utility is finished creating the volumes, click Done. After you partition a storage device, an icon for each volume appears in both the Disk Utility sidebar and the Finder sidebar. Enlarge a volume If you have multiple volumes on a device and one of them is running out of space, you may be able to enlarge it without losing any of the files on it. To enlarge a volume, you must delete the volume that comes after it on the device, then move the end point of the volume you want to enlarge into the freed space. You can’t enlarge the last volume on a device. WARNING: When you delete a volume, all data on it is erased. Be sure to back up your data before you begin. In the sidebar, select the device that contains the volume you want to enlarge, then click the Partition button ! [enter image description here]3. In the pie chart on the left, select the volume you want to remove, then click the Remove button . The volume is removed, reformatted, and all free space is assigned to the previous volume. Erase and repartition a device You can erase all volumes on a device and create new ones. For example, if you want to change the partition map of a USB, Thunderbolt, or other storage device from Master Boot Record to GUID Partition Map. If you simply want to erase a volume, see Erase a volume. WARNING: Erasing and partitioning a device destroys all data on all volumes of the device. Select the device in the sidebar you want to erase and repartition, then click the Erase button. Note: You can’t erase the device that contains your startup volume. Enter a name for the initial volume. Click the Map pop-up menu, then choose a format for the initial partition. For MS-DOS and ExFAT partitions, the name must be eleven characters or less. GUID Partition Map: Used for all Intel-based Mac computers. Master Boot Record: Used for Windows partitions that will be formatted as MS-DOS (FAT) or ExFAT. Apple Partition Map: Used for compatibility with older PowerPC-based Mac computers. Not the answer you're looking for? Browse other questions tagged disk-utility partition efi diskutil refind .